For patients who feel anxiety about visiting the dentist, sedation dentistry can be a welcome relief. These techniques, which include IV sedation, General Anesthesia, both also commonly referred to as “sleep dentistry,” oral conscious sedation, and nitrous oxide gas, offer many benefits. Some side effects can occur, although they typically will be temporary and should pass shortly. Dr. Arash Azarbal, our experienced dentist, carefully assesses each patient’s needs, goals, and medical history to determine if sedation dentistry will be right for them. If IV sedation or General Anesthesia is used, our board certified anesthesiologist will administer the medication and monitor the patient during treatment. Your safety is a top priority, and we want you to feel completely comfortable in our care. 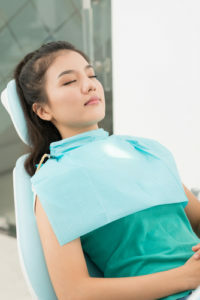 One of the most common side effects of oral and IV sedation dentistry and General Anesthesia, and often a positive one for many patients, is the inability to recall the treatment experience once it’s complete. For those who undergo oral or IV sedation or General Anesthesia, you may feel sleepy or groggy, develop a headache, or have dry mouth (particularly with oral conscious) after the procedure, and these symptoms may last a few hours. As a result, we require you to have a friend or family member drive you home following your visit. Nitrous oxide is a little different from the other two options. This sedation method is designed to wear off quickly, so you should be able to drive yourself home afterwards. Nitrous oxide, or “laughing gas,” usually has no significant side effects. Sedation dentistry can help alleviate anxiety and calm you during treatment, but not every person will be an ideal candidate for its use. It’s important to weigh each option carefully with Dr. Azarbal to find the right approach for your needs and goals.